My friend Laura recently posted a picture of her son jumping into a swimming pool. He looks wonderfully happy, as boys do jumping into swimming pools. You can see his shadow on the water. He’s in the air! I love photographs like that – especially old, pre-digital photographs. How thrilling it would be to get your photos back from the lab, or develop them yourself, and find this impossible shot in which you’d captured someone that you love floating in the air. Your dog, leaping happily. Your child, jumping from one thing to another, so proud of their ability. Children love to be off the ground, between one thing and another, dizzyingly suspended between worlds – jumping on a bed, jumping into water, jumping from a tree branch. It feels like capturing an ecstatic moment. In Charles Burnett’s remarkable movie Killer of Sheep, there’s one beautiful scene that shows children jumping from rooftop to rooftop over head. The whole sequence is one of the most striking I’ve seen on film. 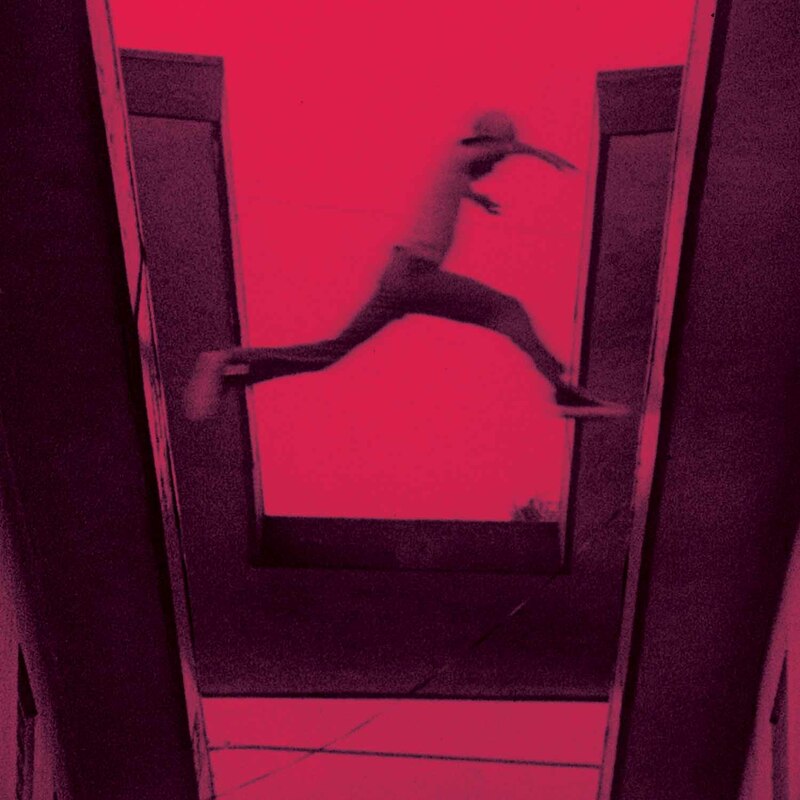 And Mos Def used a still from the movie for the cover of The Ecstatic! It’s such a perfect picture for a perfect title for a perfect album that I can’t really add anything! People and animals in mid-air! Photos that capture youth, and happiness, and motion – they catch time while it’s passing. There’s something very summery about the photos, maybe because, like summer, they seem to last forever and they’re over in an instant. If a recipe can capture a moment of summer, and I like to think that it can, surely it would have tiny potatoes and tomatoes and basil! And here we have two very easy, very summery side dishes. One is straight out of the CSA box – beet greens, chard, green garlic, tomatoes, and tiny potatoes. Is there anything more pleasing than small potatoes, boiled whole, and tossed with butter and herbs, and seasoned with salt and plenty of pepper? We used tarragon, because it’s nice with potatoes and we have it growing in our garden. But you could use any mix of herbs you like. This is a good way to use up the beet greens when you make beet dogs. I used a mix of beet greens and chard (very pretty, both!) and made a quick summery sauce of fresh tomatoes, basil, and garlic. While it’s hot you toss it with boiled potatoes, little cubes of mozzarella and pine nuts. The heat from the greens melts the cheese, and it’s all very nice. The other dish is my version of the Spanish tapas dish patatas bravas, which is crispy potatoes over a spicy tomato sauce, topped with garlicky aioli. Ever since I made almond aioli, I’ve wanted to try it with this, and it turned out really good! I made a slow-cooked tomato sofrito as the base, and you can use fresh or canned tomatoes for this. Here’s Faye Adams Shake a Hand, from Killer of Sheep. For the potatoes. 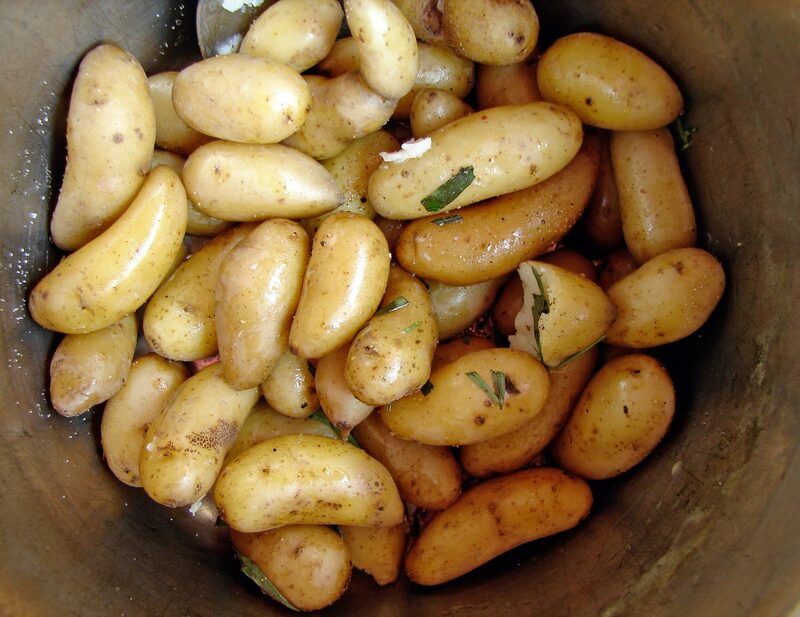 Boil tinsy potatoes in a big pot of salted water till they’re soft but still firm. Drain. Toss with butter and herbs. Season well with salt and pepper. Take them off the steam and let them cool for a moment. Meanwhile, heat the olive oil in a large frying pan over medium heat. Add the garlic and pepper flakes. When the garlic starts to brown, add the tomatoes. Cook them for ten or fifteen minutes, till they’re soft and juicy. Add the greens, and cook for a few minutes, till everything is hot and saucy. Transfer to a bowl. Stir in the basil, mozzarella, pine nuts, balsamic, salt and plenty of pepper. Gently mix in the potatoes. 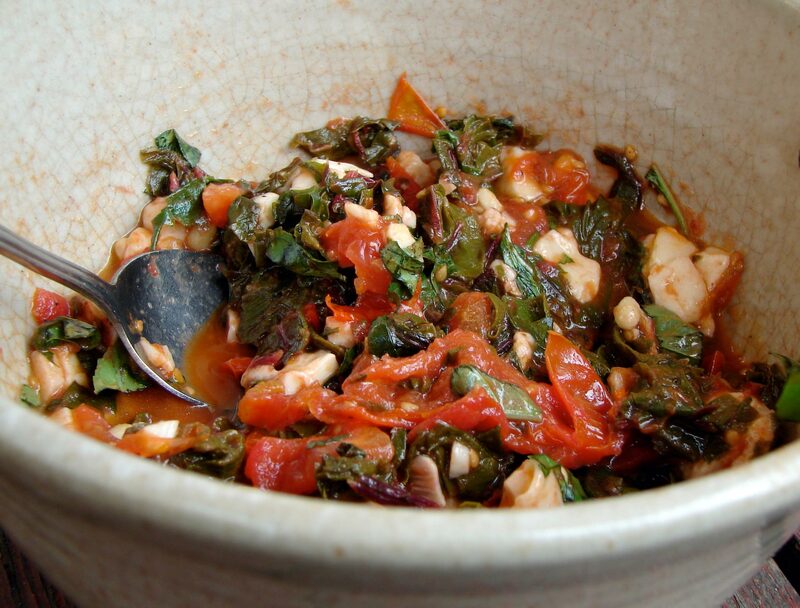 Make sofrito I used plenty of smoked paprika, and used sherry vinegar to finish – to make it more Spanish! And I stirred in lots of fresh basil, cause it’s that time of year. Roast 5 or 6 medium potatoes. Preheat oven to 425. Cut the potatoes into chunks about an inch square. Coat them with olive oil. Roast for 30 – 40 minutes, till they’re geting brown and are quite crispy. Turn them from time to time to be sure they get brown on all sides. Season well with salt and pepper. Put a big spoonful of sofrito on a plate. Pile some hot potatoes on top. Put a big dollop of cool aioli on top of that! 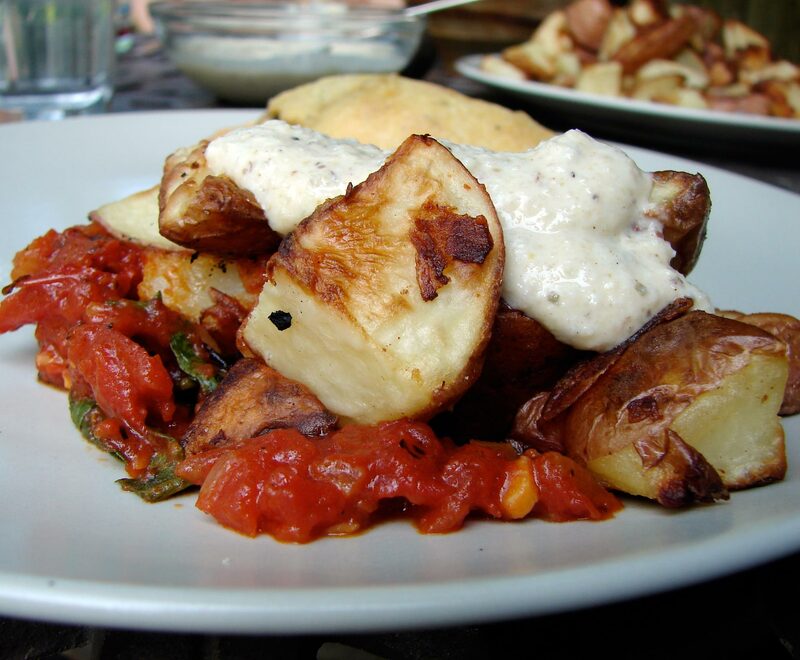 This entry was posted in potatoes, sauce, tomatoes, vegetable side dish and tagged beet greens, chard, garlic, herbs, tiny potatoes, tomato sauce by Claire. Bookmark the permalink. Cute! Does your Texas grandson watch? He does when I’m there…it was one of my English grandsons (Ellis) who introduced me to it. It’s on the BBC children’s channel over here.